I currently have owned my Ironman 4×4 fridge and freezer for the last 19 months. I have to say I love this thing. It was my first 12v fridge, I had nothing to compare it to. I first thought I would just use it for camping. I was wrong. I use it while doing grocery runs when I have to go to other stores later and I don’t want my Ice Cream to melt. Along with just putting my lunch in there when I go work on my teardrop at the shop. 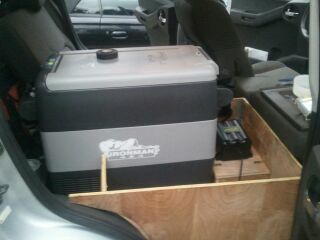 Even just for storage of cold drinks while traveling to a friends house. This fridge has served me well. The fridge is a duel volt system, it can run on 240/120 volt or 12 volt. Which is extremely nice so if you are going to park your vehicle for a while or pack it up before your big trip you can plug it into your house to cool it down before you leave, so it does not try to drain the battery. It also has a nice digital display unlike some others brands and can be adjusted down to freezing temps to keep those popsicles nice and frozen for that mid trail snack. My only complaint about Ironman 4×4 was I bought this fridge when they did there initial launch in the U.S.A. But soon after that released, their prices went up higher then ARB’s. Which for a quality fridge is still nice. 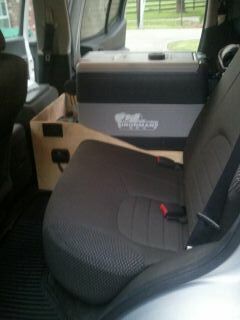 But in reality it is a little to high for a fridge that is just in your vehicle for those who will occasionally use it. To this day this fridge has served me well and I hope it serves me well through my trip and many years to come. Copyright © 2019 EXPLORING AND BUILDING All Rights Reserved.